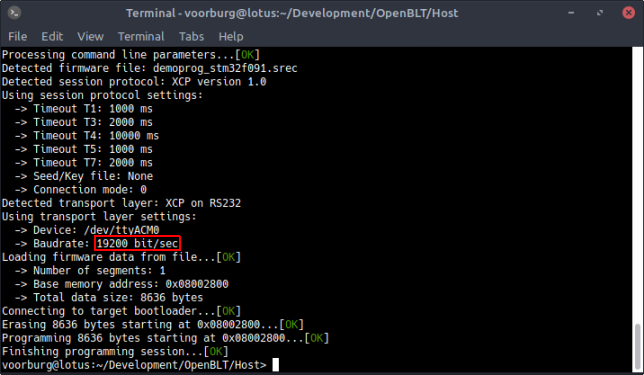 Several OpenBLT bootloader users asked, if it is possible two exchange data between the bootloader and their firmware. Even though the bootloader and your firmware are two completely separate programs in flash memory, which never execute at the same time, such a data exchange is definitely possible. This article presents a free-to-use software module that makes parameter exchange possible, by means of a shared section in RAM. This data exchange is especially useful in a situation where you want to change the configuration and behavior of the bootloader in a way that was not yet known at the time that the bootloader was programmed into flash memory. For example to change the CAN identifiers the bootloader uses during a firmware update, based on a node-address that was dynamically assigned in your user program. Another example is to pass the IP-address on to the bootloader, which was assigned in your user program via DHCP. The first part of the article delves into the design of this shared parameter module, which is followed by a step-by-step demonstration on how to integrate and use the shared parameter module. The demonstration includes an example on how to perform the actual data exchange between the bootloader and user program. The bootloader and user program in this demonstration are prepared for a ST Nucleo-F091RC board with Atollic TrueStudio as the development environment. Note though that the general concept works for any type of microcontroller and development environment combination. The bootloader and user program agree on the size and location of the RAM section. The RAM section must not be initialized by the C-startup routine. A validation method is available to determine if the RAM section contents are valid. Requirement (1) is straightforward. For both programs to share parameters via this RAM section, they both need to know where it is located. Requirement (2) is needed because the C-startup routine (the code that runs before function main() is called) initializes RAM with zero values. If the bootloader writes parameters to the RAM section that are to be read by the user program, then the C-startup should not overwrite these parameters values with zeroes. This leads to requirement (3), because if the RAM section is not initialized by the C-startup routine, the bootloader and the user program need another way to determine if its contents are valid. Think for example of a common scenario where the bootloader is started after the system was completely powered down. In this case the contents of the RAM section are undefined. The bootloader must be able to detect this situation and then correctly prepare the RAM section contents. The compiler and linker of your integrated development environment can handle requirements (1) and (2). By using a special #pragmaor __attribute__when declaring the variable that represents the RAM section, you can instruct the linker to place the variable in a specific location in RAM. You can specify this location in the linker script. Bypassing the initialization of the variable that represents the RAM section, is typically achieved by specifying noinitor noloadfor the variable. How this variable placement and initialization bypass is achieved, greatly depends on the compiler and linker that you build your software with. The demo programs presented in this article are configured for Atollic TrueStudio. Consult the documentation of your compiler and linker in case you build your software with a different integrated development environment. The identifier is a 32-bit constant value, which informs the bootloader and user program that the RAM contents holds data that follows the before mentioned layout. To further validate the RAM contents, a 16-bit checksum is calculated over its contents (identifier and data-array). This checksum is updated each time a parameter value is written to the data-array. If the identifier and checksum are checked each time the RAM section is accessed, you can be sure that its contents are valid. Function SharedParamsInit()initializes the software module. It only needs to be called once during the initialization of the software program. Typically at the start of function main(). Function SharedParamsReadByIndex()obtains a byte-value from the data-array inside the shared parameter buffer. The idxparameter specifies the zero-based index into the array. Parameter valueis a byte-pointer where the read data value is written to. The function returns trueif the read operation was successful, i.e. 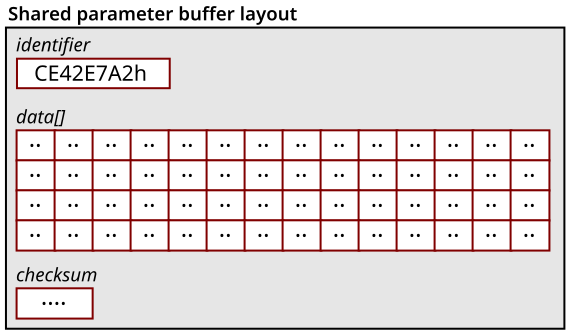 the shared parameter buffer was valid. Otherwise falseis returned. Function SharedParamsWriteByIndex()writes a byte-value to the data-array inside the shared parameter buffer. The idxparameter specifies the zero-based index into the array. Parameter valueholds the value that should be written to the data-array at the specified index. The function returns trueif the write operation was successful, i.e. the shared parameter buffer was valid. Otherwise falseis returned. Now that the idea behind the shared parameter module is presented, it is time to see it in action. This section contains step-by-step instructions on how to integrate and use the shared parameter module. In the demonstration, we are going to use the shared parameter module in a bi-directional way: The bootloader makes its version number available to the user program and the user program informs the bootloader of the UART communication speed that should be used during firmware updates. OpenBLT version 1.6.0 was used as a foundation for this demonstration. The source-file of the shared parameter module contains an internal variable called sharedParamsBuffer. It is of custom type tSharedParamsBuffer. If you look at how this type is defined, you’ll see that it resembles the previously presented RAM section layout. The source-file also contains internal functions for managing the checksum inside the buffer and for validating the buffer contents. These parts together satisfy requirement (3). This instructs the compiler and linker to place variable sharedParamsBufferinto a custom section called “.shared”. For the linker to understand what to do with data in this section, the linker script files need to be updated. For the Nucleo-F091RC/TrueStudio demo programs in the OpenBLT software package, the linker script file is called “STM32F091RC_FLASH.ld” in both the bootloader and user program. Note that the changes need to be made in the linker script file of both the bootloader and user program. This identifies the “.shared” section to the linker and informs it about what should go into this custom section. This part results in the sharedParamsBuffervariable to be placed in this section, because of the attribute that was added at the end of its declaration. Note that the first line of the section definition contains NOLOAD. This is to prevent the C-startup code from initializing the sharedParamsBuffervariable, which satisfies requirement (2). This basically takes 64 bytes away of the RAM available to the remainder of the software program, and assigns it to the new SHAREDarea. Note that the size of the sharedParamsBuffervariable is also 64 bytes. This results in the linker always placing the sharedParamsBufferat the fixed memory address 0x200000C0, which satisfies requirement (1). Now its time to look at how parameter values can be passed the other way around. It follows the same approach as in the previous section. By default the bootloader configures a fixed UART communication speed for firmware update with UART. In the Nucleo-F091RC demo bootloader it is set to 57600 bits/sec via macro BOOT_COM_UART_BAUDRATEin the “blt_conf.h” configuration header-file. In this demonstration the UART baudrate that the user program configures, for detecting firmware update requests, is changed to 19200 bits/sec and it will request the bootloader to use this baudrate as well via the shared parameters approach. Note that the 32-bit baudrate value is stored at index 3, 4, 5, and 6. This is because index 0, 1, and 2 were already reserved for storing the bootloader version number. These are all the changes needed in the user program. * valid baudrate is present in the shared parameter RAM. * firmware updates, instead of the default value. #error "BOOT_COM_UART_BAUDRATE must be > 0"
Make sure the modified bootloader and user programs are rebuilt. Then start by erasing the entire flash contents of the STM32F091RC that is present on the Nucleo-F091RC board. You can use a tool such as ST’s STM32CubeProgrammer for this. Next, program just the bootloader and start it. Refer to the demo program description on the OpenBLT wiki for detailed instructions. This proves that the user program correctly passed on the desired baudrate of 19200 bits/sec to the bootloader by means of the shared parameter module. After detection of the firmware update request, the user program activated the bootloader. The bootloader then detected the shared parameters with the requested baudrate of 19200 bits/sec and configured its UART interface for this baudrate, instead of the default 57600 bits/sec. This article presented the requirements, design and usage of the shared parameters module. This software module enables you to exchange data between the OpenBLT bootloader and your firmware in a bidirectional way via a reserved section in RAM. The shared parameters module can be downloaded and used for free, under the same license terms as the OpenBLT bootloader itself. In case you don’t have the time to manually re-create the examples described in the demonstration section, you can download the software package with the demonstration results here. Feel free to contact us with further assistance getting the shared parameters module configured and working for you. This entry was posted in OpenBLT and tagged data exchage, openblt, shared parameters. Bookmark the permalink.